Brace yourselves. 2006 is where it starts to get really bad. I like to ignore the no doubt purely coincidental fact that his worst hairstyles appear in projects released after I started watching Hindi films. This particular version of "short" neither offends me nor lights my fire. He plays a gruff detective, so it seems sensible enough. However, all is not well if you look closely. Please note the top of his head and remember what it looks like, because in a few more movies something really strange is going to be in full swing. Also enjoy the ninjas! At least, I think they're ninjas, even though this film is set in China town. My own bangs do this in summer humidity or winter wind: one moment they're safely off to the side, then they form their own little camp and start to migrate across my forehead, and finally they end up all splayed out every which way. Somewhere on that journey they actually do what they're supposed to but that never lasts very long. You'd think with movie industry-strength product they could get the front of his hair to do whichever of these looks is the one they intend, but apparently not. Hey, at least the mullet seems to be gone for good. Kanan, these next two are for you. Should I make a joke about wanting to swing with Akshaye? No? Of course, there's always the option to just slap on a hat or five. I don't know if this photo is actually a still from the film or if it's a production shot, but I like it better. This is nice hair to ruffle. The above picture looks a little crunchy. This, however, is awful. What is it about this particular haircut, foreshadowed in 36 China Town, that makes his head look like a brick turned on its end? Shorter and longer cuts are much more flattering, but somehow the geometry here is all off. The whole howlarious title song can be seen here, but it's not for the faint of heart, even if it is purelyvtongue-in-cheek. Oh thank god someone got the razor out. This is nice. Anyone who has read my copious odes to Shashi's masala waves and Abhishek in the Jhoom Barabar Jhoom/headband phase will not be surprised to hear me say that my personal preference is for longer hair, but this is flattering and smart. No side-tracking. The internet has spoken: when in doubt, buzz cut. 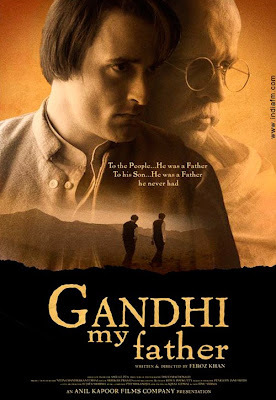 The only picture I can find of the real Harilal Gandhi shows him older and with much shorter hair, but as I recall there seemed to be a lot of effort put into the period appearances of this film overall, so I'll assume this is based on something. It seems a little small to be negative about the hairstyles in a period piece about a capital-S Serious Subject, so I will just include these pictures and move on. Flattering to his cheekbones and nose, though. There's nothing about his part in this film that I don't love: great role, great performance, and whoever styled him made him look adult and appropriate. His hair looks waaaay better than Madhuri's soccer mom-ish layers (even if her style is appropriate to her character, which I think you could argue effectively). ....And then everything went down the toilet. 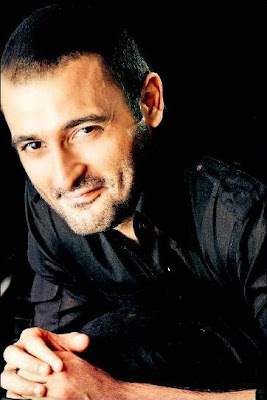 Hands-down, this is the ugliest haircut I've ever seen on him (and I have stared at a lot of photos of Akshaye Khanna in the last five years). Again with the crunchy, spindly bangs. Photo credits: Akshaye top, Akshaye bottom, Bert. The latest film I've seen Akshaye in is almost a year and a half old at this point, but I'm just grateful not to have Race as my most recent impression. This is enh. 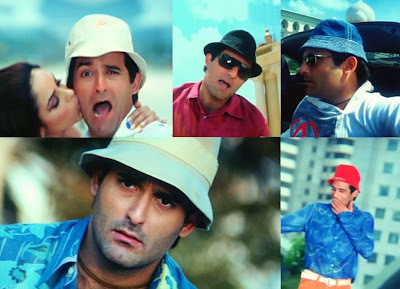 I wish he, or whoever is in charge of his overall look in films, would go back to the short hair. Sorry for the speckled screen captures. Not sure why my viewer didn't like this DVD. So what does it all mean? Is there a correlation between the haircut and the quality of the role? Let's see. 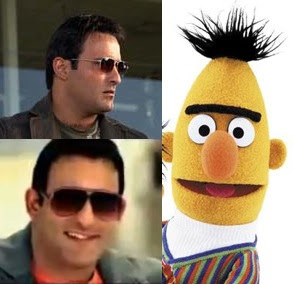 Very short hair gives us Dil Chahta Hai, Bollywood/Hollywood, Hungama, Salaam-e-Ishq, and Aaja Nachle. Fairly short but with bangs of some sort or other is seen in Humraaz, Deewangee, Hulchul, 36 China Town, Race, and Luck by Chance. Longer all over is from pre-2000 and possibly Shaadi Se Pehle and Gandhi My Father, though for all I know those are wigs. I think the lesson here, momentarily putting aside the option of a time machine, is that the shorter the better, though that's no guarantee. But don't you worry. I'm not going to leave you with meh and inconclusive analysis- not during Khanna-o-Rama! Instead, please enjoy some more shots of the crowd-pleasing short hair. Images are courtesy of the sites they link to. I thought I had screen caps for most of these films but apparently not! * Though don't read too closely or you might learn that one of the traits he appreciates in a woman is silence. Channeling my best Dianne Wiest/Helen Sinclair impression..."Don't...speak...."
You know, I'd almost swear for the bad hair ones there's a hairpiece involved. I think there's a stage guys who are losing their hair reach where they have to make a decision, to either cover it up and pretend the problem doesn't exist, or to face the fact that the hair isn't coming back, and own the hair loss. I suspect that's a really hard place to be as an actor, especially one used to playing leading man/romantic type of roles. Hairpieces, definitely. Poor guy, started losing his hair way too young. But I believe the razor cut is the best way to go, if that happens. Luckily he does have the jawline and the cheekbones to pull off that one. Good movies, less hair. Bad movies, more hair/hairpieces, is what I am getting here. 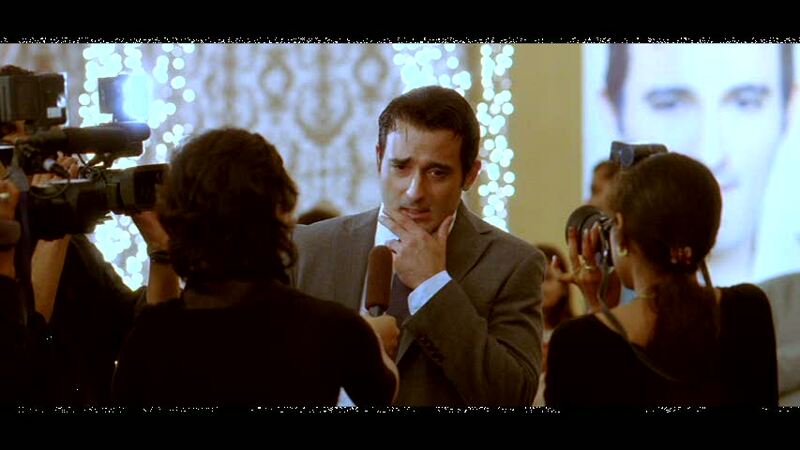 DO NOT LET PESKY HAIR STIFLE YOUR ACTING ABILITY/JUDGEMENT AKSHAYE! I really love your blog Beth! I have to agree that I have always suspected hairpieces and wigs. When his hair is shaved, you can see he has a heart-shaped hairline. But when the scary unnatural bangs show up, his hairline is almost straight across. 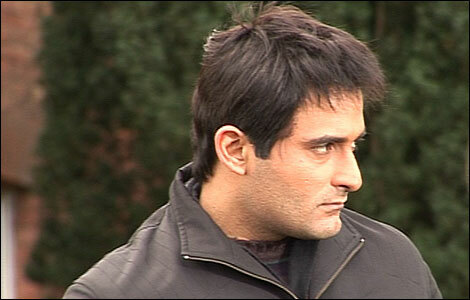 Keep the hair short, Akshaye, and then the fans can see your cute face! All I can say Beth is, hahaha! love the post!! An amazing study Beth - your effort and observations are spot-on. I have to agree on the Aaja Nachle AK. He's awesome in that movie, and he just needs to go gracefully with the short buzz. I wonder what a similar study in Salman Khan's hair filmography would be like. Even more entertaining would be Anil Kapoor's - much like Rajnikanth in the South - Anil Kapoor's hair has remained exactly the same for at least 25 years now. I just noticed that he can wear anything or not and still look awesome. Like all colors, floral and what not. 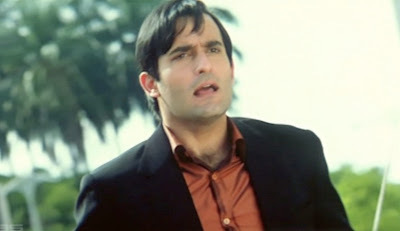 I loved him as Jeetu in Hulchul too. Time to do my Khanna-o-rama post now. 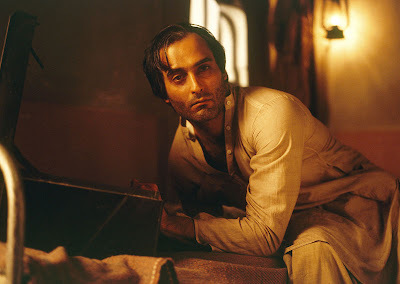 I think I do prefer Akshaye with his shorter hair cuts, but I am aghast that he has now been shaving his chest! His hairy chest in 36 CHINA TOWN makes me want to watch that film over and over again. And Beth, thanks for showing the love for Akshaye Khanna. Sometimes I end up thinking I am alone in my admiration for the guy! k - I do sympathize with hair issues. I'm beginning to see more gray ones than I am ready to admit myself and it's causing a small panic. Banno - Tragic! He totally has the face for short hair. We LOVE Rahul Khanna, of course, and him liking the festival is just icing on the cake. Ahem. Malika - Oh yay! Thank you! myrna-nora - That's true! Good call. More ammo against the weird bangs. I will contact PPCC about Anil. She'd LOVE to do it, I'm sure. Kanan - Right? Me toooo! And you are so right about the colors and patterns. Must rewatch Hulchul! 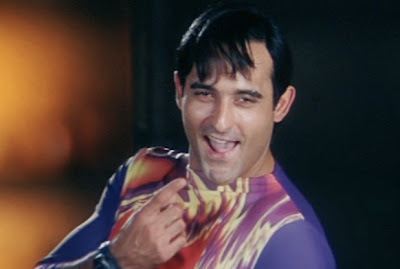 Michael - Oh no, you are never alone in Akshaye love. There are a few of us out here, including at least two in the German-speaking realms who are remaining very quiet at the moment. 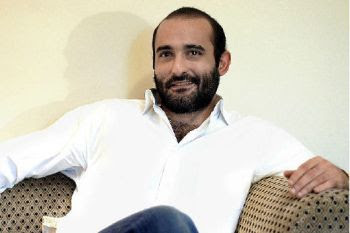 Being an ardent fan of Akshaye Khanna, "the hair-raising or lack of it" story that is raising it's ugly head(pun intended) is a true reflection of how much Akshaye is in control of his looks! It seems to me that inspite of his consistent rant tha the is a professional to the core, I still dont get it! Why on earth would he allow his stylist to get away with these horrendous looking wigs. Does he not have a say in selecting the best looking wig(if that is so required) instead of these half baked rugs that only do a disservice to the deadly Khanna looks! He needes to take a greater interest(like other actors) in his overall look and not let all this mediocrity make him look like a 2 bit actor.